2nd Crosstown Multimodal Transportation Workshop This Wednesday | Park View, D.C. 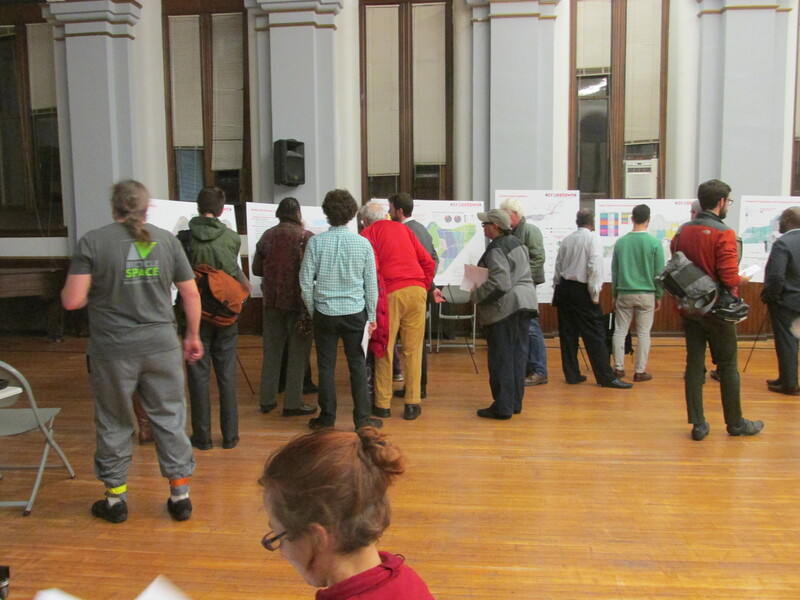 Residents examining the data boards at the February 2 Crosstown Multimodal Transportation Study. The District Department of Transportation (DDOT) will host their 2nd public workshop for the Crosstown Multimodal Transportation Study on Wednesday, April 20, 2016 in the gymnasium of Chavez Prep Middle School (770 Kenyon Street, NW). The workshop is scheduled for 6-8 p.m. with a presentation at 6:30 p.m. If you were unable to attend the first workshop, you can read an overview of that workshop here. Additionally, the study contained an interactive map of the study area where residents were able to participate by including feedback and suggestions directly to DDOT. The purpose of Tuesday’s workshop is for DDOT to present preliminary concepts that enhance multimodal connectivity, mobility, and safety in the area and gain community feedback. DDOT is undertaking the Crosstown Multimodal Transportation Study to identify improvements along the east-west connections in Wards 1 and 5, address safety concerns, optimize mobility and operations, and improve efficiency for all modes along the corridor. DDOT will work with members of the community and key stakeholders to evaluate and develop a range of physical and operational improvements. The Crosstown Multimodal Transportation Study is a key project in the 2-Year Action Plan for moveDC, the District of Columbia’s multimodal long-range transportation plan. More information about the study is available at the study website: www.dccrosstownstudy.com. This entry was posted on April 18, 2016 at 7:01 am and is filed under DDOT, Streets and Trees, traffic. You can subscribe via RSS 2.0 feed to this post's comments.